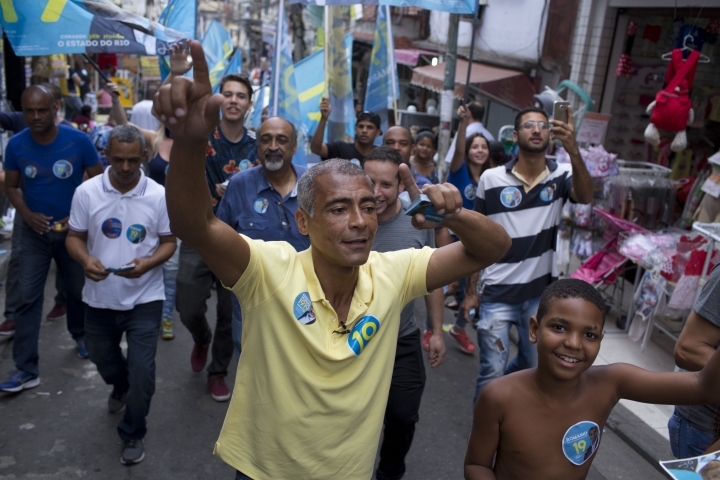 RIO DE JANEIRO — Twenty-four years after parading through Brazilian streets while lifting the World Cup trophy, Romario is again dancing in the back of pickup trucks. 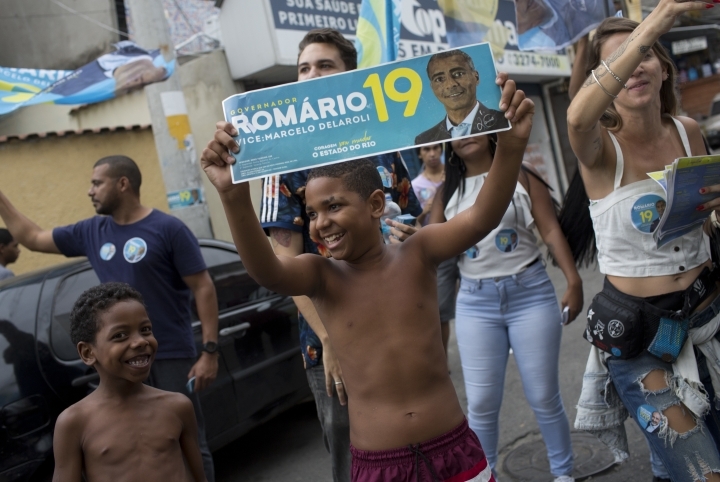 This time, he's campaigning to become Rio de Janeiro's next governor. To look more like a fresh politician, the 52-year-old Romario joined a new centrist party called "We can" (Podemos in Portuguese). 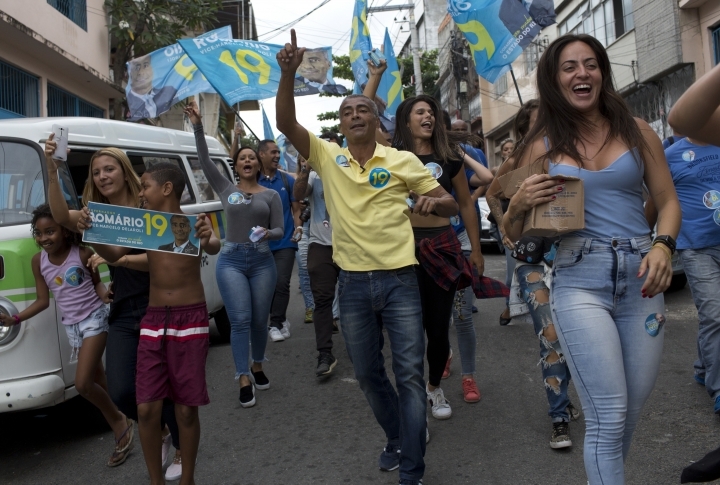 Polls indicate that on Sunday the former Brazil national team and Barcelona striker will finish second to former Rio Mayor Eduardo Paes, who ran Brazil's most famous city during the Olympics, and force a runoff vote Oct. 28. A runoff election will take place if none of the 11 candidates gets at least 50 percent of the vote. 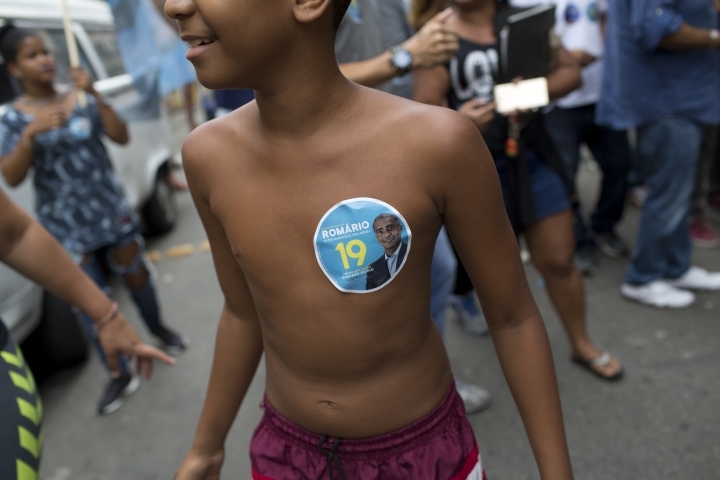 On Thursday, in one of his final campaign events, the charismatic "Shortie," as he is nicknamed by Brazilians, showed off his star power in two of Rio's most violent favelas. "How could anyone say no to this man?" said Rodrigo Alves, a 34-year-old vendor and staunch supporter of Romario, who grew up in the Northern Rio favela Vila da Penha. "Just look around Mare and you will see: There are no ads, posters or banners of his adversaries in the governorship race. Only Romario's. Why do you think that is?" he said. 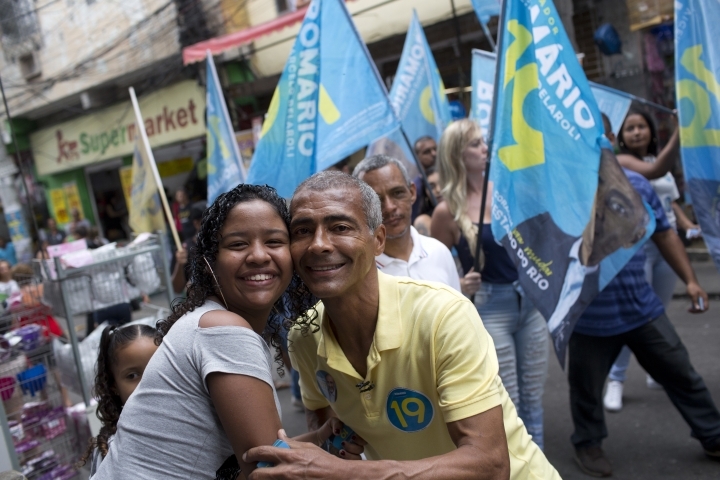 "The people of Rio need someone that truly cares," one of Romario's jingle says. "He is a man people know. He has the courage to change Rio. He is ready for this challenge." "We will put more police on the streets. I am sure that we will reduce the figures of robberies and cargo theft," he said, his tone not much different from that of other local politicians. Romario has made adjustments along the way. He has cut back on the quips that have caused controversy, such as saying the great Pele was a poet when he doesn't speak, or insulting once friend and teammate Edmundo by calling him a jester. "I need to make a correction here," Romario said. "I am the black man in this debate." That moment made other candidates take the legendary player more seriously. But that doesn't mean he gets a pass because of his fame. "You couldn't even manage the nightclub you had," Wilson Witzel said during a debate. "No one knows where your money comes from and where it goes to," Indio da Costa said. "He is building a consistent political career almost exclusively based on his football career. 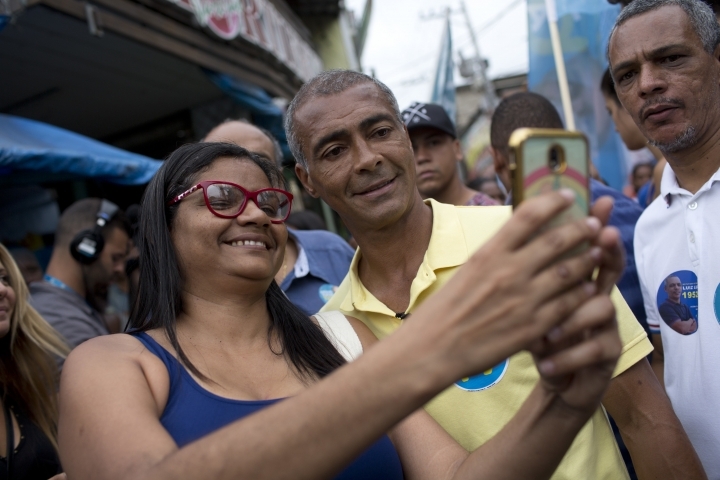 Romario isn't quite a politician yet," said Rafael Salies, a Rio-based political analyst. "That helped him in this moment of massive mistrust against traditional politicians." Bebeto, a former Brazil and La Coruna striker, doesn't have a clear political platform as state lawmaker. But he pledges, like Romario, to improve education and health care. Bebeto switched to Romario's Podemos party for this year's elections so they could team up again. "We are not in this for money. We got enough as players," Bebeto told The Associated Press shortly before jumping on a pickup with his old friend for almost an hour. "Our slates are clean and people need to know that whoever is in power doesn't want to steal from them."